The near-pristine, but deserted streets of Lumumba. Lumumba was a district of the port city of New Mombasa, Kenya on Earth. The district contains Sector 6 and Sector 9. During the Battle of Mombasa, ODST Edward Buck's SOEIV pod landed in this part of the city. 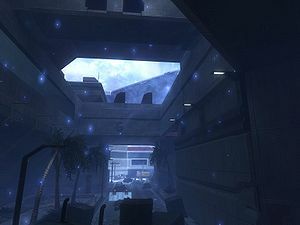 Later in the battle, ODST Taylor Miles drove a vehicle from the Uplift Nature Reserve into the New Mombasa Uplift Plaza in this part of the city. A street called "Lumumba Road" exists in modern-day Mombasa, although in a different location than this area. It is likely named after Congolese prime minister Patrice Lumumba. The streets of Lumumba, as depicted in the "Keep it Clean" trailer. A Covenant Phantom deploying troops into Lumumba.